The selection and application of expansion joints plays a significant role in system performance, quality and reliability. Leveraging our extensive industry experience since 1950, General Rubber uses a systematic approach to finding the optimal solutions for any piping system. Optimizing large and/or complex systems requires the additional benefits of restrained designs. General Rubber leads the industry in advanced and custom restrained designs and works directly with EPCs at the beginning phases of design to come up with systems which take advantage of the features and benefits of expansions joints. Smaller system footprints, lower overall costs, and optimized piping systems, can only be achieved through the use of expansion joints. Control units are used on expansion joints to restrain pressure thrust forces, in turn reducing the number of required main anchors and guides. 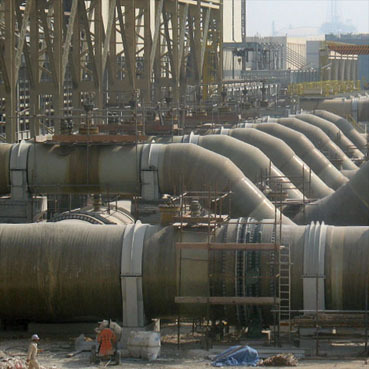 This is the first step in reducing piping system size and cost. Working with General Rubber from an early stage allows the project to be designed in a way which reduces the loads on adjacent equipment such as condensers or pumps and/or the need for large concrete main anchors. Regarding expansion joint selection and application, the simplest and often most economical approach is to select unrestrained designs to primarily absorb axial movement. Lateral movements can be achieved by using a directional main anchor (DMA). Additionally, expansion joints are designed to reduce noise and vibration, have a cycle life in the tens of millions, compensate for misalignments, provide access to piping and equipment, and relieve pipe and anchor stresses. Their spool-type bodies are constructed with full rubber flanges, a high grade leak proof tube, multiple layers of high strength tire cord, high tensile steel reinforcement, a seamless cover, and hot dipped galvanized steel retaining rings. This construction, as a standalone expansion joint, represents the most cost-effective arrangement when used in rigid piping systems with main anchors (MA) and numerous guides at specific spacing. Control units can be externally or internally attached and used as limit rods for secondary restraint, or as tie rods when the support structure or adjacent equipment has load limitations. Alternatively, an approach utilizing restrained designs—including universal tied, pressure balanced, hinged, gimbal and dismantling expansion joints—may be used to absorb axial, lateral, angular, torsional and combined movements. The pressure thrust forces in these designs are often self restrained allowing for intermediate anchors (IA) and far fewer guides to be used. These designs are extremely helpful when designing with space or structural limitations, or with load limitations on piping and equipment. The restrained designs will commonly have a cycle life in the tens of millions while also reducing noise and vibration, compensating for misalignment, and absorbing shock and anchor loading. They can also provide access to piping and equipment in a self-retracting design while also allowing for additional adjustments to its installed length. Each expansion joint arrangement possesses unique characteristics which make it particularly suitable for a given application. In some cases, two or more solutions may be possible allowing for a purely economic final decision. The above are the most common arrangements, but an almost unlimited combination of materials and designs are available that could represent the lowest cost solution to even the most demanding application. Contact General Rubber for further consultation and design review.